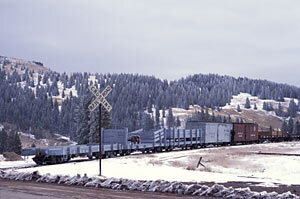 Five D&RGW work cars bringing up the rear of a freight train passing Coxo on the Cumbres & Toltec Scenic Railroad. 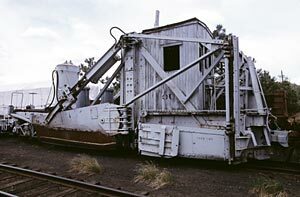 The Rio Grande narrow gauge maintenance-of-way (MOW) equipment was important (representing several hundreds of cars of various types throughout the life of the company) and included very diverse pieces of rolling stock. 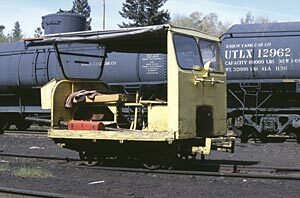 Part of this equipment was made of old freight cars used as work cars after modifications (a lot of old boxcars in the 4000 series, flat cars and a few tank cars and tenders) and of decommissioned passenger cars converted to service cars. The Rio Grande MOW equipment also included purposely built special cars used for a specific task, such as the steam rotary snowplows, flangers, derrick cranes used for construction and wrecks clean up, ballast spreaders, railroad ditchers, pile driver, etc. After 1907 these special cars were renumbered OA to OZ, following a new letter-based numbering scheme for the Denver & Rio Grande MOW equipment. The prefix letter O, for outfit, was replaced by a zero before the number of the freight cars transfered to non-revenue service, which therefore kept their original number preceded by a "0". In general, the passenger and freight cars transfered to the MOW fleet kept their original livery, whereas the lettered equipment (OA - OZ) was painted boxcar red. Starting from the fourties, the D&RGW MOW equipment was progressively painted in a light grey livery with black lettering. Some of the freight and passenger cars the Denver & Rio Grande Western used as MOW equipment survived today, mostly on the Cumbres & Toltec Scenic Railroad, where it is one of the highlights of the sizeable narrow gauge rolling stock collection of this living museum. Particularly two steam rotary snowplows, several flangers, a derrick, a Jordan spreader and various non-revenue work cars. Other D&RGW maintenance-of-way cars are preserved at the Colorado Railroad Museum. The Rio Grande had ample and various snow-fighting equipment in use on its narrow gauge system, starting from simple pilot plows put at the front end of its steam locomotives, to powerful steam rotary snowplows, and including special cars such as flangers. A large part of this interesting equipment has survived today. A part of the Denver & Rio Grande Western maintenance-of-way equipment was made of special rescue and clean up cars used in case of derailments. 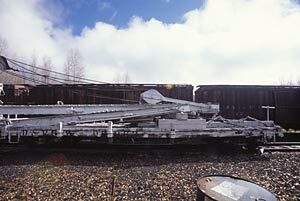 These cars (derrick cranes and various cable, block or tool cars, etc) were assembled into wreck trains, ready to be sent out to clear the tracks and recover derailed equipment. Speeders are light rail vehicles used to carry the equipment and men of the section gangs, as well as for track inspection trips. Starting from the teens, man powered speeders have been gradually replaced by motor speeders, built in particular by the Fairmont Gas Engine & Railway Motorcar Company. A Fairmont speeder, used to carry track gangs and active today on the Cumbres & Toltec Scenic Railroad. Inspection speeder MW02, built especially for inspection trips. It has been recently restored by the Friends of the Cumbres & Toltec Scenic Railroad in Chama. The Jordan spreader OU is a multi-functional piece of equipment. It could be used to shape the roadbed, spread ballast or clear weeds from the right-of-way, in winter it could also be used as snow-fighting equipment to clear snow farther from the track. To perform these tasks, OU is equipped with large wing-shaped blades, which can be deployed laterally and adjusted in height by compressed air. OU was built for the Denver & Rio Grande Western by the O. F. Jordan Company in 1923 and is the only spreader built by Jordan specifically for narrow gauge. It was used mainly on Cumbres Pass and stayed active on the D&RGW until 1968, before being transfered to the Cumbres & Toltec Scenic Railroad. The Rio Grande had another narrow gauge car of this type, spreader OV, built in 1923 as well but by its own Burnham shops in Denver. It was based in Gunnison and was last used in 1955 to scrap the Marshall Pass line, it was then itself scrapped in 1956. D&RGW Jordan spreader OU in Chama. The vertical tank contains compressed air (provided by the locomotive) used to deploy its side blades. Front side view of Jordan spreader OU showing the house and the mechanism to move the blades. Built in 1923, OU is still in use today on the Cumbres & Toltec Scenic Railroad. 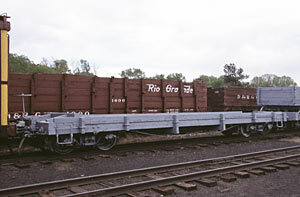 The Rio Grande used a number of boxcars as non-revenue work cars. These boxcars were early models, usually dating back from the nineteen century and converted to outfit cars to serve different purposes (living quarters, transport of equipment and tools, ...) by altering their interiors and bodies (new doors and windows). 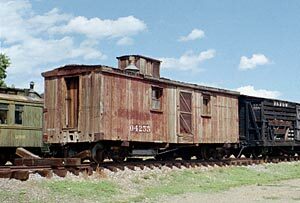 These outfit cars remained in use in company service much longer than their contemporary counter parts which stayed in revenue service, so those which survived today are the oldest preserved Denver & Rio Grande boxcars. Most of these work cars (including numbers 04255, 04258, 04407, 04444, 04426, 04904 and 04982 preserved today) were built in 1895-96 by the Ohio Falls Car Manufacturing Company and were originally 30ft boxcars, each of a capacity of 20 tons. 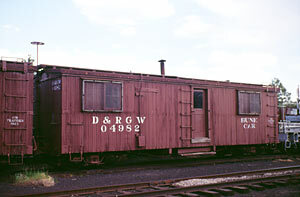 D&RGW work boxcar #04982. It was used as an office for the section foreman and as a bunk car. 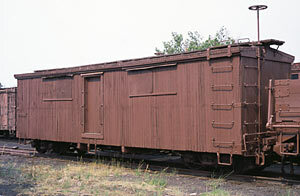 Work boxcar #04407, seen during its repainting by the Friends of the Cumbres & Toltec Scenic Railroad in 2002 in Chama. Kitchen outfit car #04255, originally a boxcar, preserved at the Colorado Railroad Museum. Note the cupola on the roof. 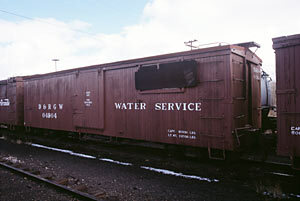 Water service car #04904, used by the D&RGW for the maintenance of its water tanks. The Denver & Rio Grande company car fleet also included several old flat cars converted into work cars early in the twentieth century. Several of these cars, including the four preserved today on the Cumbres & Toltec Scenic Railroad (numbers 06008, 06051, 06063 and 06092), were originally 30ft wood frame flat cars built in 1887. Work flat car #06008, seen during its renovation by the Friends of the Cumbres & Toltec Scenic Railroad. 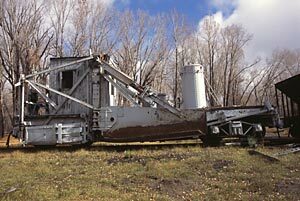 It was used as a boom car for pile driver OB. D&RGW work car #06063, seen in Chama. 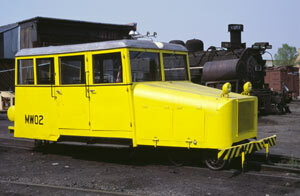 This is an old flat car modified to be used as a boom car for derrick OP.